Other historical events that were transpiring at the time the Hesskew brother were living in San Antonio occurred in the spring and fall of 1842 when the Mexican Army invaded Texas twice capturing San Antonio each time for a short period. On March 5, 1842, Rafael Vasquez, a commander of the Mexican army, occupied San Antonio with five to seven hundred men. The Texans, not being strong enough to hold the town, evacuated without a fight when Vasquez demanded its surrender. He took San Antonio, raised the Mexican flag, and declared Mexican laws in force. Vasquez departed on March 7; his invasion was regarded as a plundering or guerrilla party. The call went out for old warriors and William heeded the call. He participated in expelling the Mexican Army from San Antonio and was later recognized for these efforts by the State of Texas. (William's' Certificate of Vasquez Campaign) William received a certificate for his participated in the Vasquez campaign but not the Walls Campaign. Moses on the other hand received Certificates from the State of Texas for participation in both. Why William only received one Certificate is curious, because he did participate in both Campaigns. The The Battle of Salado and Dawson Massacre are associated with the Walls Campaign and as shared earlier, William is mentioned twice in the article by James W. Nichols on page 2. As an interesting subplot, the commander of the armies that repelled Vasquez attack was the infamous Capt Jack Hayes of the Texas Rangers, the same character that the book and mini series Lonesome dove was based on. 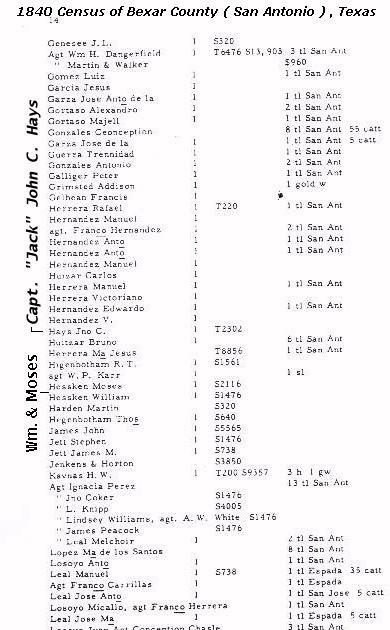 Of coarse Jack Hayes was there at the Battle of Salado too. It is with this merit that we can say, accurately, that "William rode alongside the the most famous "Texas Ranger" of all time along with his other frontier adventures that included protecting himself and his family from Indians as he transverses the various trails through Texas. Family members recall that William owned a six shooter as well as a rife. It's evident that he was a capable shot to have provided protection and game for his family during the frontier days of early Texas History. It is possible that the old six shooter is still in the family. A photo of it would be great! Who knows, maybe it will surface some day. At the time the Tronson family was preparing to leave Paris for their trip to Texas, the following events were occurring in the area near where they planned to call home. More specifically, what was to become the Castro Colony, an area 25 miles south west of San Antonio at the present location of Castroville, Texas. A battleground between the young republic of Texas and the stubborn Mexican government that was not prepared to recognize Texass independence occurred. William Hesskew was living in and around San Antonio at this time. It may be that William participated in the Battle of the Hondo. These events and the instability associated with the young republic of Texas restricted the Tronsons from settling in the area South west of San Antonio upon their arrival to Texas and San Antonio. They may have even stayed with William, assuming he had a place in San Antonio waiting for the Texas government to give their authorization to move into the area. There was a substantial delay, and it may have been that the Tronsons a long with the Hesskews later moved to Gonzales in lieu of the Tronsons actually following through with their plans to participate in the colonization efforts of Henri Castro. Family documents were translated. 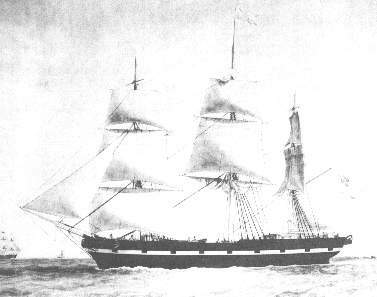 A marriage certificate for Jean Tronson and Jeanne Simon, the birth certificate of their daughter Anne Marie Tronson, and the record of the ship the Tronson family came over to Texas on were reviewed by Scott Hinkle. On March 31st 1824 in the town of Clery le Grand, Jean Tronson (age 26 years, 3 months, 7 days (therefore b. 12/24/1797); son of Antoine Tronson (a farmer) and Marie Anne Petit-pas) married Jeanne Simon (age 30 years, 10 months, 10 days (therefore b. 5/21/1793); daughter of Henry Simon (a farmer) and Guhennes Broches). On March 15, 1826 at 10 PM, at their home in the same town, a daughter was born to them who they named Anne Marie Tronson. In about.1834 they had a son and named him Joseph Tronson. These few facts solve several mysteries. 1. Anne Marie came over with her parents and brother. Non French speakers have seen the Oct. 23, 1842 date on Jean and Jeanne's marriage certificate and assumed that was when their wedding date and therefore came to the conclusion that they could not have been her parents. The 1842 date was NOT the wedding date. It was simply the date on which the Tronsons obtained certified copies of vital records from the French government. This would have been both prudent and necessary before immigrating to Texas. 2. Joseph was definitely Anne Marie's (Mary Ann's) younger brother. 3. On the 1860 census a 60-year-old male and native of France named Jane Tronson was living with the Hesskew family. This was Mary Ann's father Jean Tronson. Back in France Jean had been a farmer (cultivateur). There is a lot more in there and it will be awhile before I can take the time to give you all word for word translations. Meanwhile, I thought I'd go ahead and send you some of the basic facts. I hope you enjoy them. Note; the above picture is an actual painting of the Ebro! Some years back family members visited the town were they were from in France and spoke with other relatives who still lived there. Research reflects a Joseph Tronson, presumable, Mary Ann's brother, grew up and remained in Texas. After writing to the Texas Archives, I secured a copy of the Civil War Pension for Joseph Tronson. He was a 21 year resident of Bexar County at the time he applied for a pension in 1899. He was 77 years old and listed his previous occupation as a carpenter. It is noted on his pension application that he served in Co. I, 2nd Texas Infantry for ten months. As to if Joseph had a family, I do not know. I have not researched that yet. 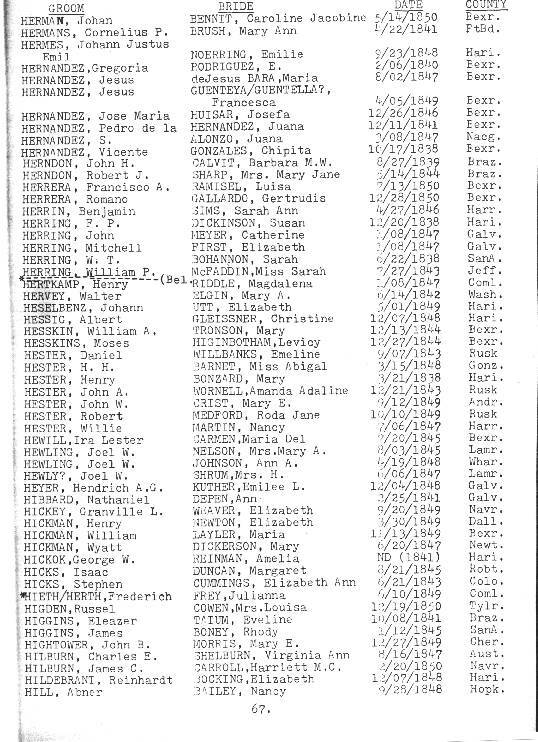 Other evidence suggest a Tronson in census records in the Galveston area at one time, but I don't have the specifics on that currently. William and Mary Ann as shared earlier did finally move to Gonzales and began a family. They probably moved there shortly after their marriage in 1844. Mary, their first child was born a year later and Mary Ann would have 13 more children before she and William finished their contributions to the growing republic they were helping to sustain. Here is an example of the type of home that William and Mary Ann probably lived in. 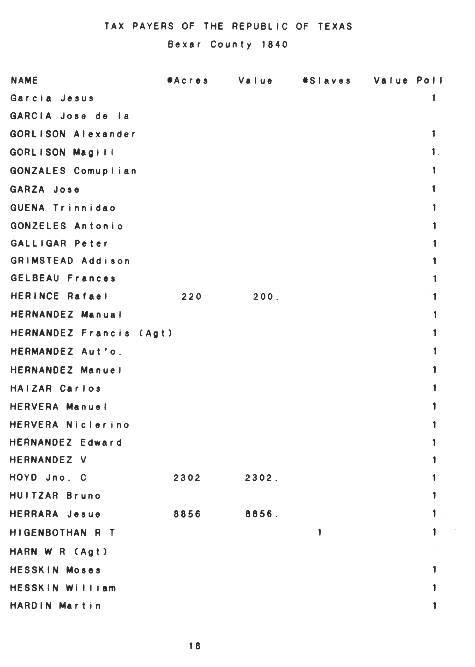 What William did exactly prior to his settling down to raise his family in Gonzales is some what speculative at the present. We do know that William farmed and ranched as most families in that era did. Additionally, William Heskew is identified in the 1847 minutes of the City of Gonzales as a ferry operator on the San Marcos River! As to if William had ran other Ferries, I do not know, but it must have been an interesting trade. William was required to pay a tax to the City of Gonzales for operating his ferry. Additionally, William and Moses both did some surveying it appears. In 1848 William bought 728 acres in Gonzales. Where that property was specifically located, I'm not sure, but there is a Hesskew Springs identified in the book by " The Ties that Bind" a history of Gonzales County , Texas by Marjorie Burnett Hyatt. Possible this was where the Hesskew families lived. She says " The Hesskew family was one of the very early families in this area, listed on the the road from Pilgrim to Smiley use to go by Hesskew Springs, 1860 census at the Salt Stream Post Office. before the present Hwy. 87 was built . There is still a windmill at the site of the old Hesskew home & school." After trying to locate this windmill, I was unsucessful. Wm. sold 300 acres of the 728 acres he owned to William Carroll Billings, the husband of Mary Jane nee Hesskew Billings, his daughter, 2-17-1868. Possible the Billings family might know more about this land and how to acess it if its still in the family. Wm had sold another 300 of this tract of land earlier. This article details the raid in detail. It is noteworthy in that the area that the Indians attack occurred was near the "Sandies" which is relatively close to the area that the Hesskew family was probably living in 1848. ( See Hesskew Springs on the map). ALSO this was the same year that Moses Hesskew was elected sheriff of the County. He later resigned the following May of 1849. It would seem highly likely that Moses as the sheriff of the County would have joined the 32 men who formed a company to repel the raiders. And William Hesskew, well you'd think he 'd be there as the Captain of the company was his old commander during the siege of San Antonio back in 1835. I have not found too much to substantiate William's participation in the Civil War but we are still researching this. Update, Yes we now have a document that Ruth Claunch located that reflects was a member of the a fore mentioned company. It was probably a local Milta group that was formed in communities all across Texas at the beginning of the Civil War. As to if William ever left the Gonzales area during the War, I can't say, but my suspicion are he did not. I would think his age in conjuntion with his young families needs would have restricted his activities during the Civil War, but I can't say for certain. For reasons unknown William moved from Gonzales County after the 1860 Census . 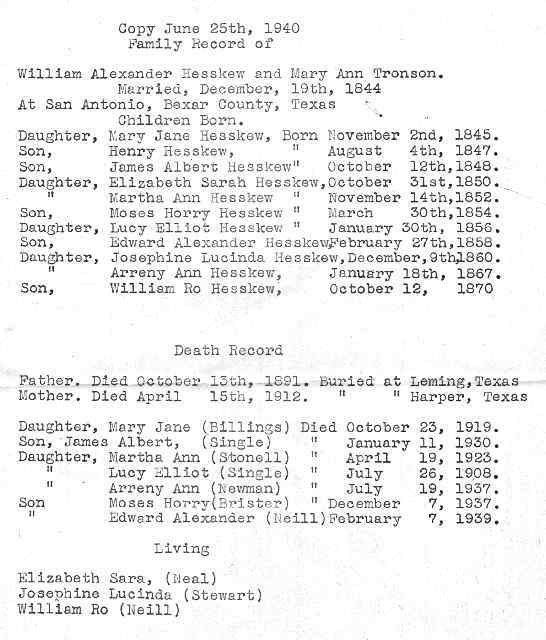 It appears that William moved some of his family to old San Patricio, San Patricio Co, Texas by January 18, 1867 at which time Arreny Ann Hesskew, one of William's daughters and my Great Grandmother, was born . By the 1870 Census, we find a Heskew, William residing in Refugio County which is north of San Patricio County. From some of the stuff I have read on Texas History, after the Civil War, shipping cattle and the hide industry were pretty big in addition to the more famous trail drives. Maybe William was involved in some aspect of the cattle business by the 70s. Or maybe he had seen too much of the Sutton Taylor feud in Gonzales and packed it out of there? More than likely, it was an economic reason for his move would be my guess.